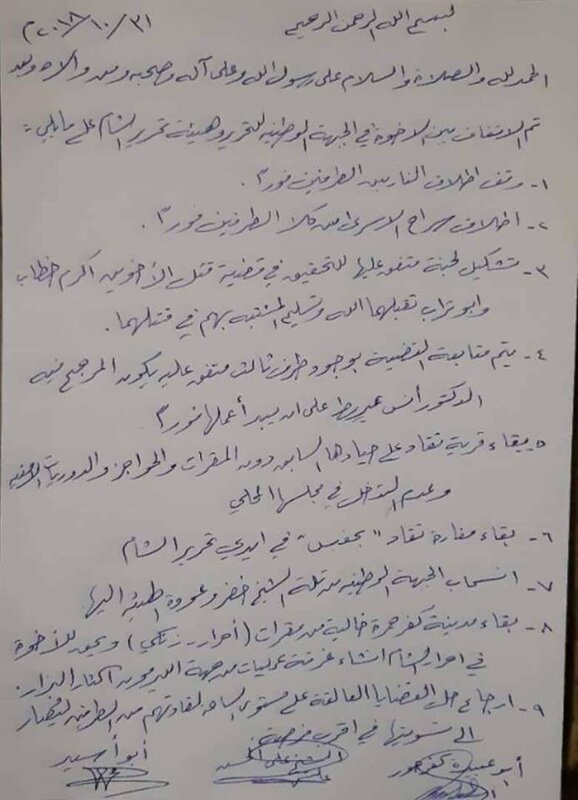 Hayat Tahrir al-Sham and Al-Jabhat al-Wataniya lil-Tahrir (National Liberation Front) reached an agreement ending clashes between the two in western Aleppo. According to the agreement, both sides will release all prisoners, as well as neutralize Taqad and Kafr Hamra. Al-Jabhat al-Wataniya lil-Tahrir will be allowed to set up an operation room on Al-Layramoun front in Kafr Hamra. The two sides also agreed on establishing a committee lead by Sheikh Anas Ayrout, which will investigate the killing of two Hayat Tahrir al-Sham’s officials in Kafr Hamra. Turkish Land Forces’ artillery shelled Syrian Democratic Forces-held Ayn al-Arab (Kobanî), Kor Ali, and Silam in the border area between Syria and Turkey. One element of the Syrian Democratic Forces was reportedly killed by the shelling. Syrian Democratic Forces responded to the shelling by destroying a Turkish Land Forces’ military vehicle with an anti-tank guided missile near the border. Improvised explosive device killed one and wounded one market guard near a Free Syrian Police’s headquarters in the village of Al-Dana. 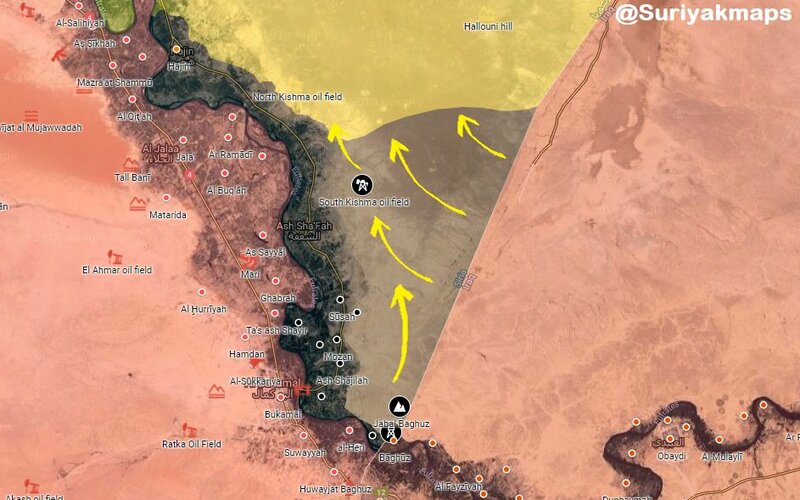 Syrian Democratic Forces retreated from Jabal Baghouz, South Kishma oil field and a dozen of border positions in eastern Deir al-Zour. Islamic State’s Amaq Agency claimed that at least 33 elements of the Syrian Arab Army were killed and wounded during today’s clashes in Tell al-Safa area in eastern Al-Suwayda. Islamic Emirate of Afghanistan (Taliban) killed two elements of the Afghan Local Police in Sang Zard area of Pashtun Kot district. One element of the Islamic Emirate of Afghanistan was killed in the encounter. Afghan National Security Forces killed four and wounded three elements of the Islamic Emirate of Afghanistan in Faizabad district. Afghan National Security Forces killed two elements of the Islamic Emirate of Afghanistan in Pachir Aw Agam district. Afghan National Security Forces killed two elements of the Islamic Emirate of Afghanistan in Gardez district. Afghan National Security Forces reportedly killed 55 and wounded eight elements of the Islamic Emirate of Afghanistan in Qarabagh and Waghaz districts, as well as cleared several villages in Qarabagh district. Islamic Emirate of Afghanistan killed seven and wounded five elements of the Afghan National Army, as well as destroyed two vehicles in Qarabagh district. Islamic Emirate of Afghanistan’s Al-Emarah News stated that the group shot down an Afghan Air Forces’ military helicopter over Jamal Ghazni area of Anar Dara district. According to Al-Emarah, the deputy commander of the Afghan National Army’s 207th (Zafar) Corps, general Neamat Khan, the head of Farah’s provincial council, Farid Bakhtawar, and 22 other individuals were reportedly killed in the incident. Islamic Emirate of Afghanistan’s sniper killed one and wounded one element of the Afghan National Army in Mizan district.